Previously in Stick Cats: Our heroes ate the petals of Catnip Rose and embarked on an unbelievable mental journey to gain temporary omniscience, all in the hopes of discovering the hidden location of the Octo-Kitty! I can't say "THANK YOU" enough to the stupendous Katie Henderson, who came back to deliver this conclusion to the bizarre Catnip Rose vision quest. 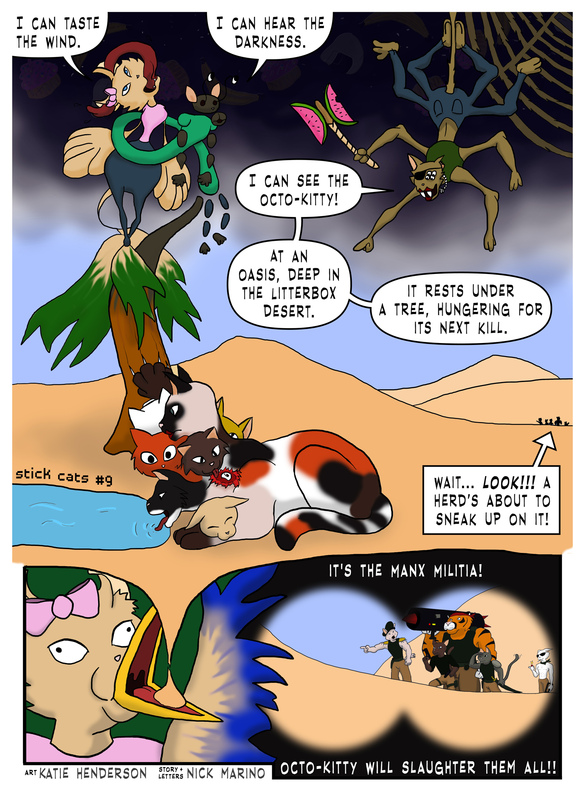 Just like last week, make sure to check out the large version of the comic to see all of Katie's incredible detail (especially the Manx Militia!). Next time, sadly, the Stick Cats will return to being sticks. While I can't promise you any breathtaking artwork, what I can do is guarantee a kickass adventure! haha, the bird beak. good stuff. hahah yeah it's pretty excellent. the beak was all Katie. the script only said, "Marmalade still floating in whatever trippiness she was floating in before. She's all hyped up." my favorite part is the Manx Militia because Katie just whipped them up outta thin air from the description "a crew of five armed cats"! they look so awesome. My fave is the young upstart in the back, lighting a cig like "Meh, I'm shirtless, meh." YEAH! I love that guy. He's great. I think my favorite one is the big orange guy carrying the rocket launcher, mostly because, well, he's got a badass rocket launcher.